Hi Boniface, Glad you're back. I stumbled across your blog a month ago, and I've gotten hooked. The fact that you can be a Trad and not get swallowed up by it. That you have perspective is very refreshing. And I don't just mean the sedevacantists(talk about demonic pride), but I see in comboxes sincere Catholics who reject some blogger based on a single error or weakness or blindspot and be completely blind to all the good the blogger does. Anyway, keep up the good work. Thank you for your kind words, Tom. May you be blessed! But don't we have one? I mean there is 2,000 years of magisterium there for the reading without having to cobble together one. Novelty is novelty. 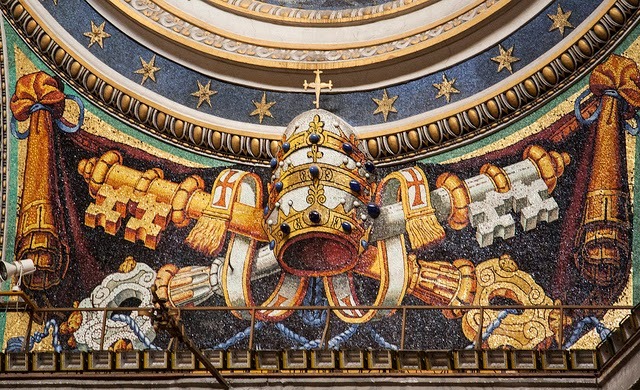 If Catholics cherry-pick the true magisterium just like NewCatholics are we better off? That part of your point is well taken. Cultural specifics can and do change so be careful not to mix the fairly superficial with the all-important. We really do need to get back to our history which was ripped out of our hands around 1960. It is all there - no need to pick, or reject, anything. Don't we have to believe all the Church teaches, in the same way, with the same docility as was done in the past? When we compare present so-called magisterial pronouncements with those of the past, it really is clear - hold to the real magisterium, and reject any thing else. If it smells, it's rotten. Sounds like just another way for a "traditionalist" to justify your own sinful pride. Boniface accepts like myself vat ll and post vat ll church. It takes lots of prayer and faith and trust. It's one thing to study historical periods of great turmoil in the church, and there have been many. We are living through one of those times today. I've learned the hard way the perils of pride which are mostly hidden from us. humility does not come easily to our fallen nature. And if you think you are not guilty of pride(re the gist of your comment)that means you are. Our judgements,our convictions are appalling prone to error which we don't see without help from the Holy Spirit and relentless prayer. I think much of this is the result of a deadening of conscience. It's easy to talk about a malformed conscience among those who, say, promote contraception. It's a lot harder when you see this kind of thing. What I believe has happened is that people are so disoriented by the lack of teaching these days that they are willing to forfeit their own prudence just to grab on to something that seems solid. In doing so, they mistake that solidity for the rock of the Magisterium. People should discern that the universality of the Church extends to a lot of different things just like the stuff you named. And even things that might be great of themselves might be harmful to others in a different spiritual situation. I want to avoid quibbles, but a "deadened" and a "malformed" conscience are different. Cardinal Dolan may have deadened his conscience presuming that he was taught the true faith. Whereas, a teenager today probably was never taught the faith correctly, so his conscience was malformed. Also, your last sentence - your meaning is ambiguous. "And even things..." - do you mean things outside the body of church doctrine? Please clarify. I can go along with that, but I think in terms of practical effect that it's a distinction without a difference. Both involve checking our discernment at the door in favor of what we're getting from someone else, whether it's society or a misguided priest. My last sentence is actually referring to things that are promoted by the Church. Fasting and mortification, for example, are very good things of themselves. However, for a person who has trouble with scruples or who has no spiritual director (or a perhaps a poor spiritual director) might be placing themselves in jeopardy with such practices. My overall point here is that Catholic spirituality is a very broad spectrum of things. In this context, I'd say that because one person might be called to heroic levels of fasting and virtue doesn't mean that they should criticize those who are not. Thank Boniface once again for you logical and level headed prospective regarding the situation you refer to in this post. I hope many people read this post because it needs to be heard. I too "have very strong opinions on most of these points" you made and I too "am not so certain in them that I would accuse those who don't agree with me of being subpar traditionalists." One thing I am certain of is that all this madness taking place in the Catholic church between modernists, traditionalists and extremist traditionalists is somehow God's Divine Will. One day our sacred traditions will be restored to it's former glory and universality through the triumph of Our Lady's Immaculate Heart. So everybody don't get too strongly opinionated, prideful and judgmental. Just hold your horses, be humble and pray very hard. Hi bill, "one thing I'm certain of..." do you mean God's permissive will or that God is punishing the church for being unfaithful? I don't see that it matters too much...from my understanding of Scripture, God can chastise His people either permissively or by His positive will. If God is positively punishing His church, that matters a great deal. That would mean that the church has sunk so far into inequity that God decides to punish his Church. That can send catholics into despair and start to abandon Peter' Barque. so far, I see His permissive will, a very different spiritual reality. Then the problem is with those interpreting the actions of God in the world, not with God's actions. I have never encountered anything in Scripture (where God positively chooses to chasten the Israelites and their kingdom) nor in Tradition to suggest God can't positively will to chastise the Church. "For whom the Lord loveth, he chastiseth; and he scourgeth every son whom he receiveth" (Heb. 12:6). This is clearly true on the individual level; I don't see why it could not be true on the corporate level. Hi Boniface, Something that always amazes me is the fact that we humans can communicate at all given the complexity of language and the complexity of our interior lives. I see it here as well. I started out asking Bill for clarification re God's will and it went from there. I read your last comment several times before I got what you were saying. I also had to struggle with my lower ego which just wants to go "its" own way. And of course I agree with your very deep biblical/theological understanding. This just confirms what I said above that I got hooked on your posts a month ago. The point I just came to see is that I'm coming from my apophatic spiritual life in which it's difficult for me to separate myself from the crisis in the church. As in abstract knowledge - subject/object. I don't know if this makes any sense or not. My spiritual life, which is God's gift, includes vulnerability and helplessness. I live from my interior life which has it's own crosses. Anyway I depend on guys like you to fill in the rather large gags in my biblical/theological understanding. Keep up the good work. Debate, questioning, contrary opinions, etc. are always welcome here, so long as the spirit of the discussion is good and people stay on topic! And if I am right, it is probably luck - I have been wrong many, many times, as my readers will tell you! Thanks Bill. I have one question re "governs". I assume you don't mean that God is the cause of evil. As the lay Pope, Raider Fan, is this close to excommunicating you from the Trad Kingdom, Boniface. No, not at all. In my understanding evil is permitted by God, but God is never the cause of evil. I am a reader of this blog, and have been following it for a very long time, especially through though times of wondering if I was supposed to subject myself to a novus ordo mass for the sake of fulfilling a Sunday obligation. It is through this blog especially and that of Athanasius Contra Mundum that I was able to stand tall and balk at the idea of compromised Catholicism. Now, I am one of those traditionalists who thinks that the Latin Mass being said by the diocesan priests, FSSP and Institute are problematic. As a point here, if you could listen to Fr. Gregory Hesse online (youtube) and tell me the reasons why he is wrong, then I would gladly listen. For sure, it's a delicate subject, but I think we are at a point where lines need to be drawn to save in the faithful what it means to be Catholic. III)The Latin mass and sacrament and other traditional practices cannot be held hostage for any reason whatsoever, let alone signing a document permitting one to say it. Those (not all) who say the Latin mass and are subject to Novus Ordo bishops are handicapped. Who will remind the faithful from the pulpit that actually, 21 Copts are not strictly able to be called martyrs (contrary to the Pope) and neither are they able to be canonized. Who will tell the faithful that getting pagan ashes on their heads and kissing the koran is not Catholic? Who will the faithful that the bishop of Rome cannot bow down and get a "blessing" from a leader of the Anglican church? Someone linked up Fr. Hesse's video on this on my Facebook page; I have yet to watch it. But please note that that particular argument about EF Masses and the SSPX was only incidental to the main point of this post. I will watch the video when I have time, but I have a hard time believing that the ONLY really acceptable Mass to go to in the whole Latin rite is one offered by a group in a irregular canonical situation. When the bible talks about a great apostasy, to whom do we Catholic think it refers? To us of course. The great apostasy will not sound a great bell. Instead, it will be a subtle music playing in the background over something that is good and true. Some will hear the introduction of a perverse sound at the beginning and retreat to safety. Some won't hear it at first, but will eventually stir because they note something is increasingly wrong with the sound for it moves them some strange way. Some won't hear the adulteration--not even after it becomes the only sound emitting from the perverse instrument. They will dance all the same, because to them, it is just music. If the days were not shortened, even the elect will be lost. When Our Lady says Rome will lose the faith and become the see of the AntiChrist she was speaking in plain language. When Our Lady told Lucia to make sure the envelope is opened before either her death or in 1960, and Lucia asked why, Our Lady said, "It will be clearer then"
All this is to say that we are past the dawn of a new Church. We are in the thick of it. Yes, the sacraments are barely valid depending on who is saying mass and how it is being said. But how can we act as though God is please with this? He has Rights which we have to protect. If we reason something is wrong and we permit it to continue under His name, then are we not in cooperation with that evil? In the case of England under King Henry VIII, should the faithful have continued to attend the valid mass of those priests and bishops who had signed the oath of supremacy? What about when small changes were introduced to the mass under King Henry VIII, should they have said, a few changes here and there--no problem. When the last queen of France was offered confession by a pious priest who said the Latin Mass but was part of the group who had aligned with the state, should she have not declined vociferously? FYI, I accidentally deleted the second part of your comment. If you post it again, I will make sure to publish it. Apologies. I was using my clumsy touch-screen. If we are circumventing these very things and teaching a different thing to Our children and friends, then we must explain why we are doing so and why we must not do what we see our priests, bishops and popes do. Today, vast numbers of people are baptized into the Catholic Church holding heterodox ideas, but do not realize it. This is all because of the 60s, 70s, 80s, 90s up till now. Fifty years of confusion. Bishops themselves are heterodox and do not realize this--so too are the priests that work in their dioceses. Because of people like Fr. X at Mundelein seminary who thinks Von Balthazar was right about hell being possibly empty, we have people touting him as a great thinker and Catholic evangelist...he too is breeding spiritual sons and daughters. The Von Balthazar theory has won. The Church of the New Advent is the Novus Ordo Church as it is today. Things will not get better. The movement of the silent apostasy is picking up steam. Vast numbers of people will wake up and find themselves Protestant. Can we not see that we are the Hellenistic jews of Maccabees? We have mingled with society so much that we are incorporating pagan and protestant things into the faith. How will God chastise us? We must read the book of Maccabees to see how it ends. I am not publishing your comments, because once again, you are rambling about the same rant you cannot seem to get off of - Vatican II, Ad Gentes 7, "the dead visible", SSPX, etc. You only use (spam?) comboxes to continually push the same rant and contribute nothing valuable to the conversation. As long as you continue to post things totally irrelevant to the article, I will continue to block your comments. And please do not waste my time trying to demonstrate how your comments are somehow relevant to every post.